Fifty shades of brown, these are the hues in which we tend to imagine our Autumns, but it struck me while wood-wandering one sunny day recently that we are still just within that transitional period of the year, around the equinox, when yellows and oranges stand out brighter than ever within the forest colour palette. 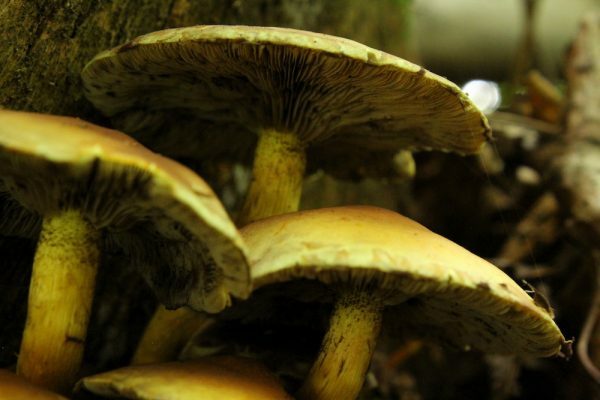 As we ease into October, the woods are positively bursting with Ochre russulas (Russula ochroleuca), Honey fungus (Armillaria mellea) and Laughing Gyms (Gymnopilus junonius) and there is also still a good chance of crossing paths with the standout egg-yolk smears of Fuligo septica, or the Dog Vomit slime mould . And so as UK Fungus Day returns on 6 October to shine its annual light on what for so many is still a mysterious world, I thought I would choose for this month’s Monthly Mushroom a species that is as common as dirt and so regularly spotted due to its glaring yellow hues that it seems impossible to imagine heading out into any wooded area at this time of year without coming across them: Hypholoma fasciculare, or the Sulphur Tuft. Fitting then that while these ubiquitous cap fungi may look seductive, they are actually rather noxious to humans, although slugs and insects seem to like them. There is not a source out there that doesn’t list its consumption as leading to gastric upsets, in the form of the full Monty of stomach pains, vomiting and diarrhoea, sometimes accompanied by convulsions, impaired vision and paralysis, and there have even been a number of reported fatalities. 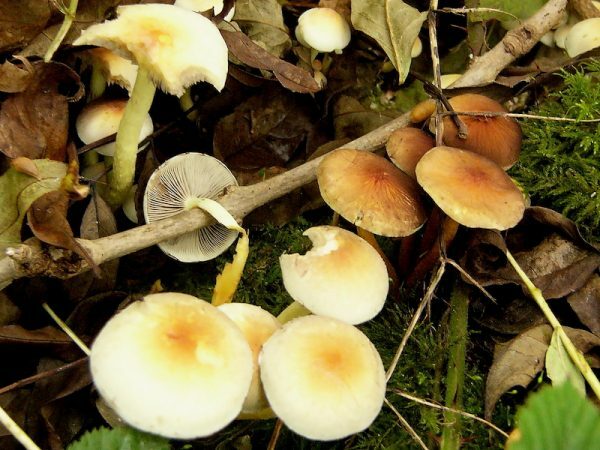 Helmut and Renate Grunert’s Field Guide to Mushrooms of Britain and Europe (1991) states that “recent research has shown that it contains poisons which are also to be found in Amanita phalloides (Death Cap)”. 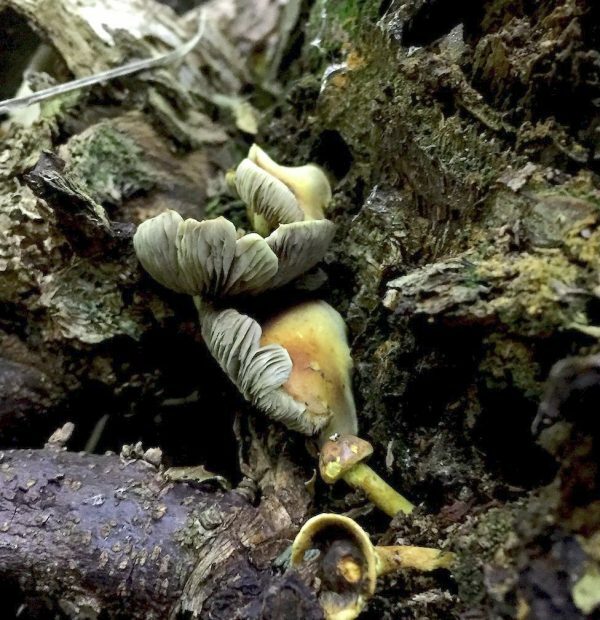 In fact, one of the key rationales for choosing the Sulphur Tuft for this Monthly Mushroom focus is explicitly to warn people off from so much as even contemplating sampling this most commonplace of woodland species. Sulphur Tufts possess a number of other distinguishing features aside from the fact that they are lurid yellow and are found sprouting abundantly, often in dense clusters, from stumps, logs and the dead wood of standing trees (there is usually a lot of moss around wherever I have found them!) 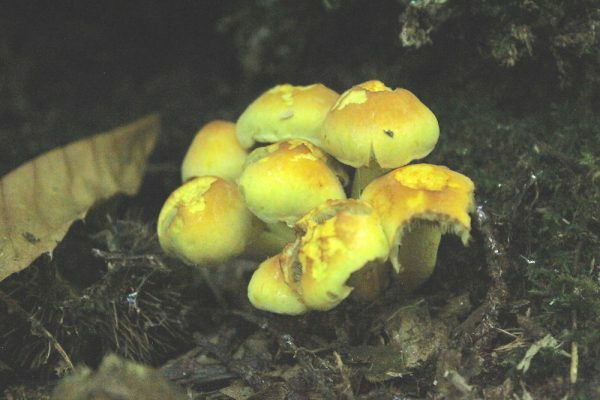 Individual mushrooms are relatively small, with the cap, which starts out dome-shaped before flattening as it expands, getting up to around 5cm in diameter and tending towards orange in the centre. O'Reilly, again on the First Nature website – and I just want to take the time quickly to recommend this author’s rather wonderful book Fascinated by Fungi – suggests that the genus name of Hypholoma, meaning ‘mushrooms with threads’, is in part due to the gauzy partial veil that connects the stem to the rim of the cap on young fruit bodies as they emerge. In fact, even when the cap is fully opened, remnants of this veil are perceptible on its margins and also on the faint fibrillose “ring zone” at the top of the stem where it was once attached which, as Roger Phillips’ describes in his Mushrooms and Other Fungi of Great Britain & Europe, is “often made more obvious by trapped purple-brown spores”. If one takes a print by leaving the cap on a white piece of paper for several hours, this spore colour is another key to identification. 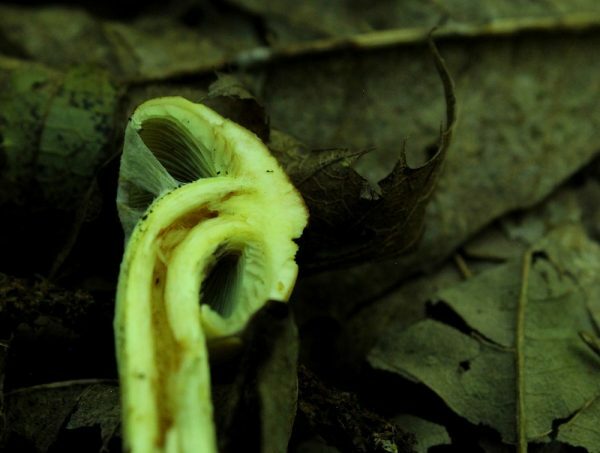 The stem is yellow, like the cap, with a slightly scaly, fibrous pattern to it and darkening towards its base. It varies between 4-10cm in length and is relatively narrow, typically thinner than a centimetre, and often curved. Slightly confusing is that not a single one of the fungi guides I possess explicitly mention that it is hollow, as can be seen below and also in the cross-section in Phillips’ book. The gills are adnate (that is they are attached to the stem to their full depth) and crowded, or densely packed together. They start out as the same sulphur yellow colour as the flesh, but turn towards olivaceous yellow-green and then dark brown. 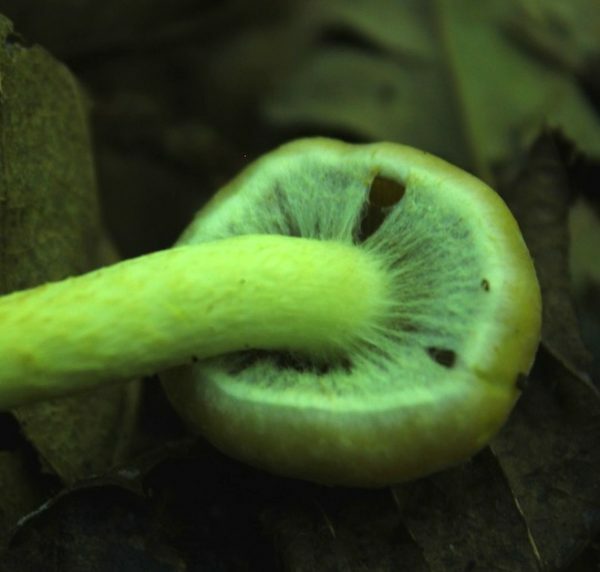 This slightly sickly green-about-the-gills look is another one of the features aiding positive identification of the Sulphur Tuft. 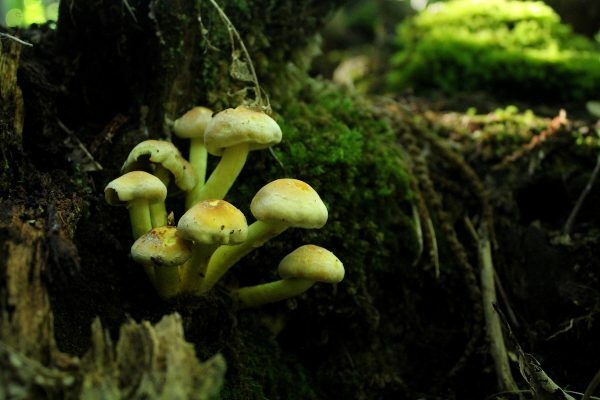 Sulphur Tufts are an omnipresent part of the woodlands landscape during the mushroom hunting season, appearing en masse all the way from June to December. They are distinctive and easily recognisable, and the only way you are likely to confuse them with anything else is if you are not paying attention. That said, there is still some room for variation within these descriptive parameters, and this in itself is good reason to pay closer heed if you are concerned in pinpointing your find down as accurately as possible. 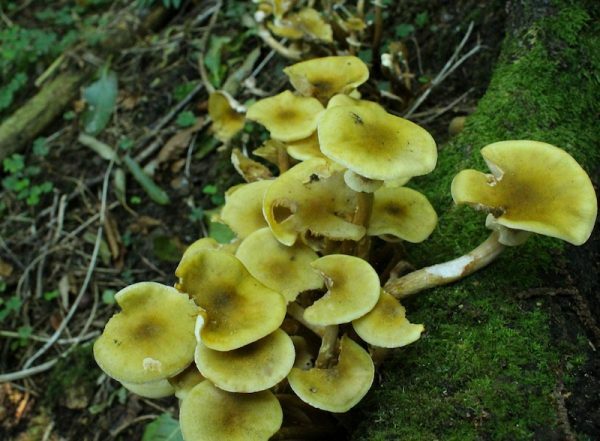 For example, if you really want to get into the finer details, there are quite a few other species in the Hypholoma genus, such as the smaller, darker Snakeskin Brownie (Hypholoma marginatum), with its distinctive snakeskin patterning on the stem, or the larger russet-coloured Brick Tuft (Hypholoma lateritium), not to mention a host of others without English common names. And then there is that other common woodland species that also appears in great numbers in dense tufts or clumps ranging in colour from yellow to dirty brown, and which is itself, as Shelley Evans and Geoffrey Kibby write in their Pocket Nature: Fungi (2004), “one of the most confusing for the beginner to identify as it has such a variable appearance.” This is Armillaria mellea, or the Honey Fungus. No doubt we’ll get to discuss this species in a little more detail in a future post, but I’ll mention it just in passing for now if only to draw attention to the differences with Hypholoma fasciculare. The name refers to the colour, though some might say that there is a fine line between honey-coloured and sulphur-coloured, especially in the dull half-light of the forest. 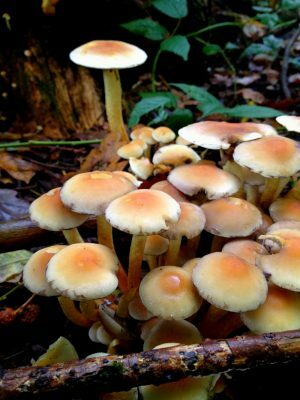 The most obvious distinction is that Honey Fungi are larger, with the cap reaching about 15cm in diameter and a stem of a similar length. The cap is also covered in fine light coloured scales, although these disappear with age and in any case, some specimens are rather scalier than others. in this case breaking down the cellulose of dead wood and leaving the lignin, a process that takes several years and leaves the rotten logs or stumps for other fungi, bacteria and insects to move in and continue the process of breaking down. 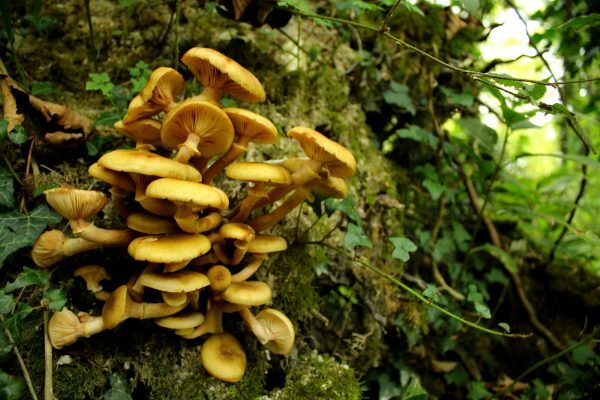 The Honey Fungus, however, is parasitic, a pathogen that feeds off living trees and does them no good at all. 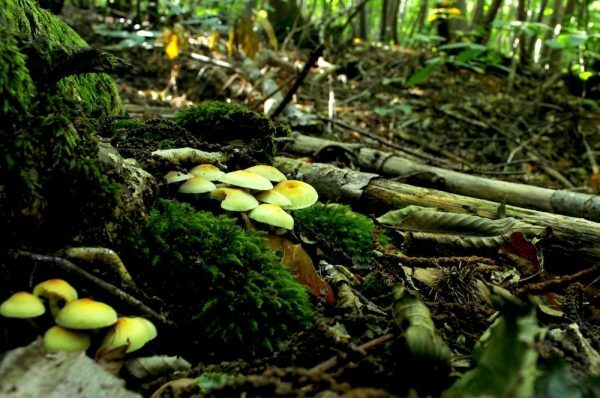 In other words, Sulphur Tufts are in many respect handy things to have around your woodlands, while Honey Fungi aren’t.